Our Premium Harmony Adjustable Air Mattress provides a better night’s sleep experience, and compared to the Select Comfort™, Sleep Number® c4 bed, is a higher quality mattress at a less expensive price. Pillow Top: The pillow top features a layer of impression-resistant, plush new-age Pillow-flex foam covered in Belgian Damask material. The pillow top backing consists of a moisture barrier that protects the internal components. The smart pillow top is entirely removable, refluffable and refreshable providing years of a healthy sleep environment. Convoluted Foam: A 3-zone high-density and extra-thick 1.5-inch polyurethane convoluted foam covers the interior vulcanized air bed chambers provides entire body support and reduces pressure point stress. 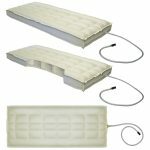 Air Bed Chambers: The Adjustable Air Bed Chambers are 25-gauge double-layered, cotton canvas-covered Vulcanized Latex Rubber, and the borders are double-seamed (1.25″ seam reinforced with another 1.25″ seam) for maximum strength. The air bed chamber I-Beam design is double-reinforced, and the chambers are of a multi-directional box baffle design to eliminate the hammock-effect of other brands of air chambers. The kink-free hose assembly is steel reinforced, and sealed with flexible rubber at the time of manufacture, and has no external connection which eliminates air loss concerns. The brass-reinforced connection boot provides a durable connection, and the Twist-N-Lock barrel cam-lock inflator connector locks in place to prevent accidental disconnect. The Twist-N-Lock connector houses a seal that prevents air back-flow. Contour Liner: The full-fit contour liner provides a finished look to the adjustable air bed and adds to the function of a cleanable and exquisite sleep system. 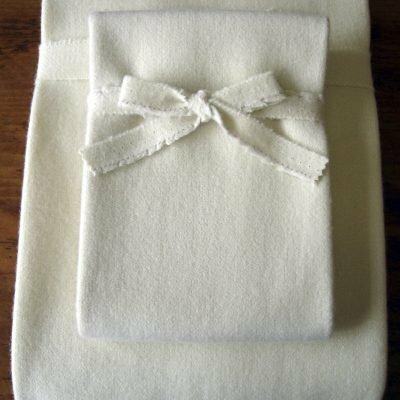 A fabric sling set provides a Memory Weave™-wrapped power edge support for the adjustable air bed chambers by connecting the 4 side rails inside the bed to prevent “bowing out” of the mattress. The Memory Weave® fabric increases the durability and longevity by eliminating oxidation of the foam power edge supports. 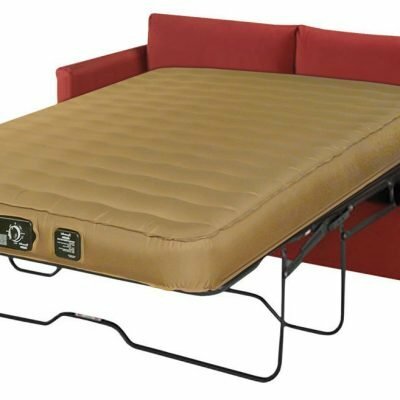 Mattress Components Enclosure: All of the adjustable air bed components are encased in durable material connected to the pillow top assembly with a double, self-mending zipper. Air Bed Inflator Pump: The pump is a dual control, pneumatic, super quiet, and quick-fill digital air bed inflation system. The 4-function ergonomic control features 4 primary functions at the touch of a button including Sleep Memory Mode and Bed-Made-Ready Auto Fill Mode. 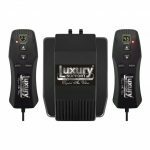 Our pneumatic Digital Ultra air bed inflator pump facilitates firmer air chamber inflation and a broader spectrum of adjustability. The inflator pump is easy to use, and the LED digital readout of the firmness levels is easy to see, even in a dark room. Our air bed inflator pump offers 50 scientifically accurate comfort set points in one point increments. The accurate scientific measurements map out pressure points on the sleep surface. The inflator pump remembers comfort settings, and the Memory Mode setting allows air chamber adjustment to individual firmness settings. The pump also features an automatic bed fill mode that gives your bed that Bed-Made-Ready look at the touch of a button. 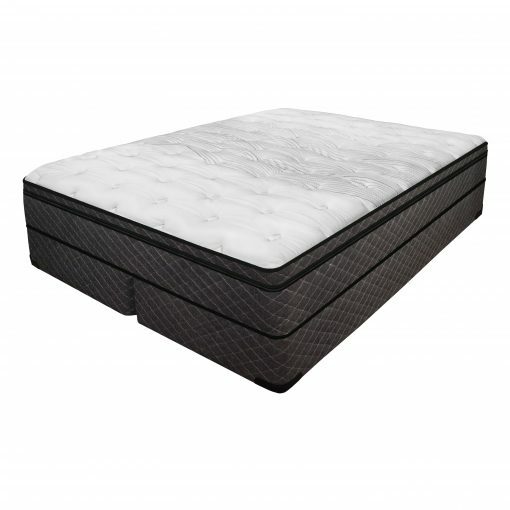 The dual controls allow individual air chamber firmness to be set on each side of the air chamber bed mattress. Foundation Available: Our adjustable air bed suspension mattresses must be set on a solid foundation, and we have foundations available for all of our mattresses. The foundations are all wood construction, with Masonite tops and continental tailoring. The foundations meet the strict regulations of the 16 CFR Part 1633 Standard for Flammability for mattress sets. 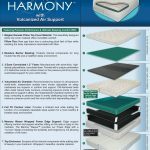 The Premium Harmony is compatible with Convert-A-Bed Technology and is the perfect vehicle for temperature-controlled fluid support, advanced air sleep, space-aged Memory Cell, naturally conforming latex, or orthopedic active coil. NOTE: Premium Adjustable Beds has no affiliation with the Select Comfort Corporation. Select Comfort™ and Sleep Number® are registered trademarks, and the information on this site regarding Select Comfort™ and Sleep Number® are for comparison and information purposes only. We do not sell the Select Comfort™ brand and are in no way affiliated with the Select Comfort™ corporate entity.Our Premium Harmony Adjustable Air Mattress provides a better night’s sleep experience, and compared to the Select Comfort™, Sleep Number® c4 bed, is a higher quality mattress at a less expensive price.